In Cars, these four trouble making tuners play a brief but pivotal role in the film. As you probably remember, they are ultimately the ones responsible for getting Mcqueen lost. From left to right we have: DJ, Boost, Wingo and Snot Rod. These have been released numerous times, but the ones I have here are from the original 2006 "Desert Series" line. 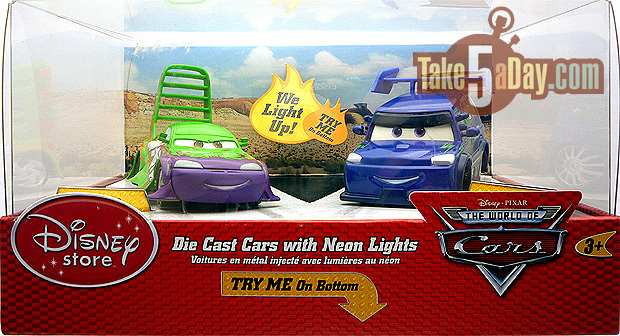 They have also been released with added accessories, such as "with flames" (which can be found at stores now) and "with boots"(known as the "impound" versions). 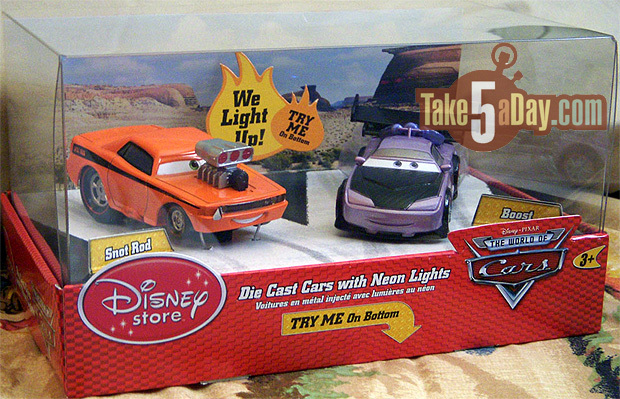 These characters were also released as electronic 1:43 scale diecasts at the Disney Store with neon lights! I never actually got those, but you can view the two sets here and here. You can pick these characters up online if you haven't already. I like to use eBay and Amazon. As usual, good luck on the hunt and your expanding collections!